Lighting is nearly the most important part of decorating your home or office. There’s a look and a feel brought on by illumination. Period lighting has long been embraced by country and antique lovers alike. 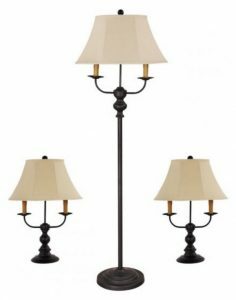 The charming, comfortable feel given off by forged iron floor lamps, rustic chandeliers, and unique table lighting has always been a welcome addition to any room. We carry a wide selection of hanging chandeliers. Most designs are electrified reproductions of old forms, which originally held hand-made candles. These new models are aged, distressed and hand-rubbed for that authentic look. Old Williamsburg colors and combinations of colors are available to pick from. Choose from our great selection or special order the perfect style and color to meet your needs. We also suggest you use a dimmer with your chandelier for that perfect effect. We also carry an impressive selection of table lamps. Electrified glass lamps, unique styles of iron lamps and a notable collection of replicated versions.